The human liver is considered by many to be the most crucial organ. It its responsible for cleansing blood, protein synthesis, biochemical production, glycogen storage and even plays a major role in metabolism. 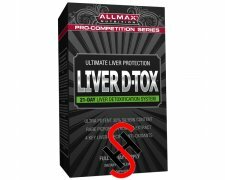 Liver D-TOX is a combination of clinically proven herbal extracts in their purest form along with powerful Vitamin Anti-Oxidants such as Vitamins C & E and Selenium. NAC (N-Acetyl-Cysteine) is so potent that it is used in cases of Liver Toxicity due to Acetaminophen. The Milk Thistle Extract (MTE) that we have sourced is not only standardized for 80% Silymarin, but also standardized for the lesser known, but highly potent 30% Silybin content. MTE is widely known for its proven ability to reduce liver hepatoxins and is often employed to ensure a return to a cleansed state. AllMax has sourced a 95% pure Curcumin Extract renowned for its potent detoxification and anti-oxidation functions. In animal studies Curcumin has been shown to attenuate liver injury due to ethanol, iron overdose and carbon tetrachloride and even showed a trend toward reversing cirrhosis. Artichoke extract at 5% Cynarin has been included for its hepaprotective function. Katuka Extract has a centuries-long tradition in Ayurvedic medicine as a liver tonic. As athletes we put our livers through a lot and depend heavily on it for everything from protein digestion to blood toxin cleansing. If you want to perform at the highest levels, you owe it to yourself to do a 21-day Liver D-TOX. As a dietary supplement, take 1 pill twice a day. Use for a full 3 weeks.